As a peace studies major at university, the subject for Dan Gudgeon, 32, was something academic, until he found out about a program that seeks to promote peace through football. "I wanted to do something real," Gudgeon recalled. For someone who is as great a football fan as himself, it was thrilling to find out that football could be used as a tool. "Football 4 Peace" is a diplomatic sports movement that seeks to bring people together and enhance understanding. Headquartered at the University of Brighton in the U.K., the movement has a presence in countries including South Korea, Israel, Germany, South Africa and Columbia. 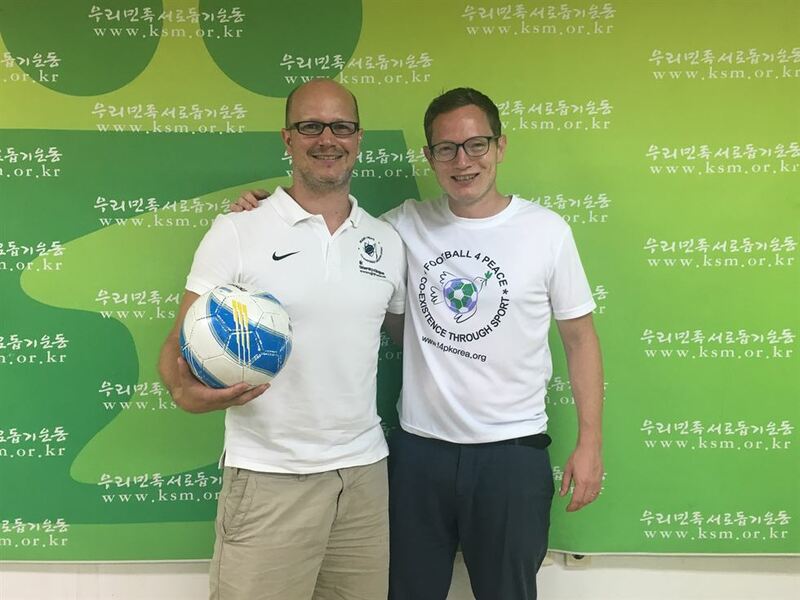 The Korea Sharing Movement (KSM), a local civic group, is undertaking Football 4 Peace activities here, and it recently held a workshop to train coaches. Graham Spacey, Head of Operations of Football 4 Peace International, was in Seoul for the workshop. The workshop is held to keep the program sustainable by having Koreans teach Koreans, instead of having to rely on coaches from Brighton. "Football 4 Peace is about teaching students about values including respect, equity, inclusion and life skills such as team work and communication," Spacey, 39, said. "It aims to engender a desire for peaceful coexistence _ it is value-based learning, not just playing football." The program is designed to enable this by, for example, counting fair play points or by having teams play without a referee. In Korea, where multiculturalism is growing, the program appears to be able to play an important role. "There are different cultures coming from China and Southeast Asia but here there is a lot of emphasis on being Korean here," Gudgeon said. He said the KSM is working in Suwon with several community groups with multicultural backgrounds, to instill values of inclusion, equity and respect. Also relevant is the issue of North Korean defectors who face discrimination here due to their backgrounds. "We have many North Korean defector children in the program, but we do not highlight that they are defectors, and make an effort to build an environment that is positive and inclusive," Gudgeon said. Gudgeon is also interested in working in North Korea, which appears to have become more feasible under the current detente between the Koreas. "We're trying to talk about these things to prepare the young generation for a future of exchange," he said. "There is so much potential here on the Korean Peninsula that we can see fruit through sport." Spacey said the grassroots level movement is about "becoming responsible for the change you want to see in society, without leaving it up to politicians." "We want to give this opportunity to as many children as possible," he said.